We all want good quality safe tyres, but we also want affordability, good fuel economy, safe traction, safe braking, good wet weather performance and of course, low noise. Finding the right set of tyres is like finding the right shoes for the right sport. Many motorists have something less than the best tyre for them. The right tyre is not by any means the most expensive, it's a balance of all these factors including price. When your talk to us we'll listen to what you need your tyres to do and then we'll prescribe the right tyre for you and your car. The Best Automotive Clinic provides tyres that are quality and are at highly competitive prices. Safety comes first, never buy dirt cheap tyres just because they're cheap. We can get you any brand of tyre. 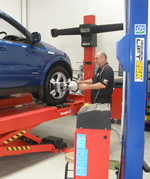 And we carry out a full fitting and balancing service as well as a wheel alignment. We can also repair punctures, if the puncture is repairable. So if you're looking for car tyres come to The Best Automotive Clinic and get yourself a set of new tyres. There are many signs you may need new tyres, such as uneven wearing of the tyre, noise, the steering wheel isn’t straight or your car may be pulling to one side. But as we say, we can order any in. Every year around 3.9 million passenger tyres and 1.2 million truck and other tyres reach their end of life in New Zealand. At The Best Automotive Clinic we use reputable tyre collection companies to ensure end of life tyres are disposed of correctly. You can find out more about tyre recycling strategies at Tyrewise. 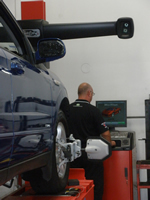 When fitting new tyres to a vehicle it is essential to complete a wheel alignment as well. This extends the life of tyres by ensuring they wear evenly. Vehicles will also get better fuel economy with correct wheel alignment. Put simply, wheel alignment involves adjusting the angles of the wheels to ensure they are parallel to each other and perpendicular to the road. The suspension system impacts on the alignment and The Best Automotive Clinic will check this as well. Alignment is sensitive and something as simple as nudging a curb with force can affect it. Book you vehicle in now if you notice your steering pulling to the left or right when driving on a straight road, if the steering doesn’t return to the centre easily after turning a corner or if the vehicle tyres are wearing unevenly.